The aim is to have Weavile active by turn 2 ready to use its Shadow Charge attack, which is the reason for the maximum number of Sneasel allowed. You’ll want to attach the Special Dark Energies to the Gardevoir and/or Gallades, preparing them for attack. Then you can start the beatdown. Weavile’s Dark Engage Pokémon Power turns out to be very useful with the Special Dark Energies, because it turns Gardevoir’s Psychic Lock attack into 80 damage and power lock for only 3 energy. 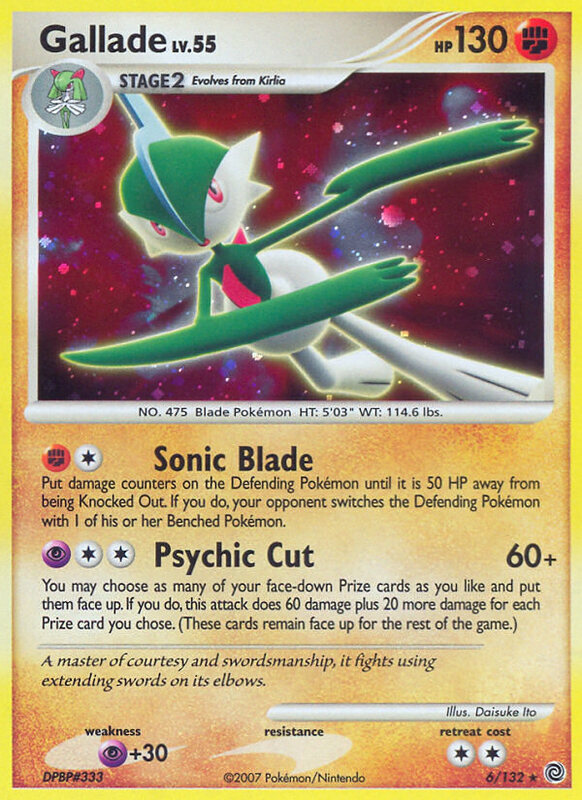 It also reduces the number of Prize cards you have to flip with Gallade’s Psychic Cut. With Psychic Lock and Psychic Cut both costing PCC, a Psychic Energy and 2 Special Darkness work just fine. Nidoqueen can be teched into almost any deck that sports Rare Candy. It works nicely here because if one of your Pokémon is damaged, you can safely Teleport it away with Gardevoir LV.X’s Pokémon Power, then attack with a different Pokémon. Teleport for the same Pokémon again next turn and it has now gotten rid of 40 damage over 2 turns. If the opponent begins power locking before you have a chance to set up, well that’s where Cynthia’s Feelings comes in handy. 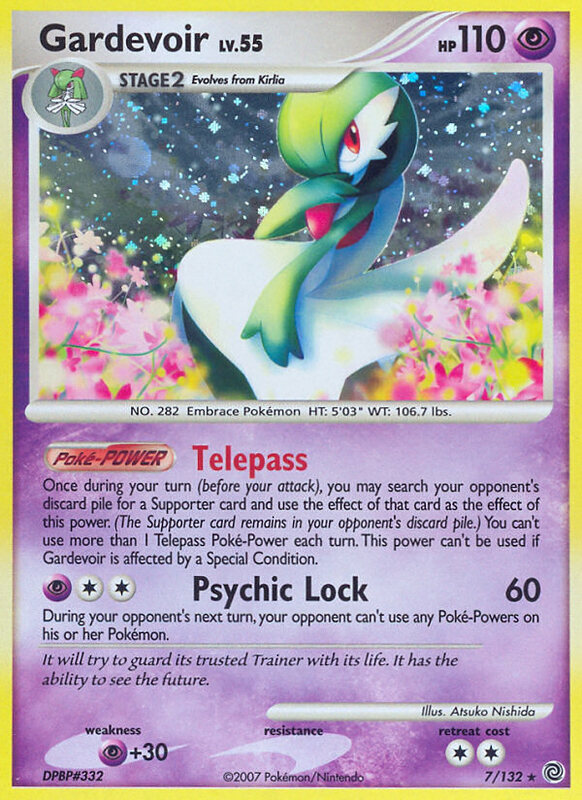 The lone Upper Energy is there in case your opponent has a faster start than you, so you’ll need to do a comeback attack with either Gardevoir or Gallade to stay in the game. Have any thoughts on the list? Post a comment! That’s the gist of running 4 Sneasels. Nidoqueen in GG makes the decks attackers tanks, and can help against Skuntank G. I could see the Sneasels slowing him down in the long run, and he has no way to discard them. Yep, the reason for the 4 sneasel is to increase the chances of starting with it. BiskitFoo’s got the reason for teching in Nidoqueen. True drawing into Sneasels over and over again could slow it down, but I think it’s worth the risk. You can always put em at the bottom with Cosmic Power. Thanks for the comments Qua and BiskitFoo! Sigh… I love this deck so much… but it is pretty hard to keep consistent. 3 Energy cost is really hard to deal with. Anybody thought of throwing 1 Sableye in here? Against Gengar, it is just a Roseanne and Unown Q away from donking. If my list is inconsistent then this list is just as bad. but this is what my deck looked like when i first built it. Hey! I just want to say thx for providing such useful information. Hey is this a free design or a paid one? Well, just want to let you know we hear about your blog.